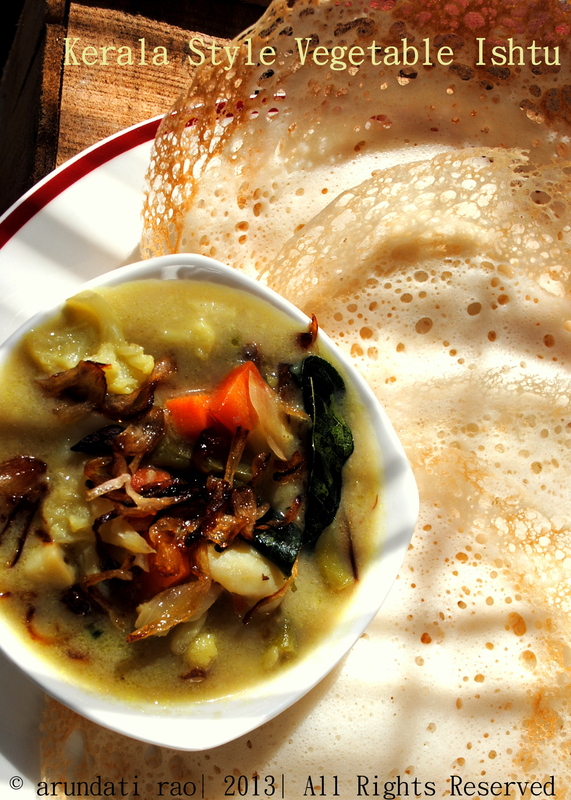 Kerala Style Vegetable Ishtu is the perfect accompaniment to Paalappam. It is a classic breakfast dish. 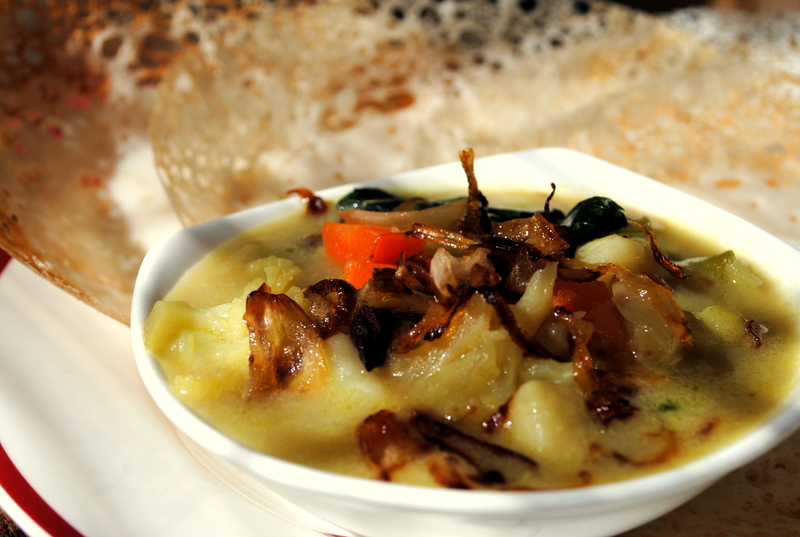 The vegetable ishtu is a medley of vegetables simmered in the naturally sweet coconut milk. There is no holy grail in recipes and each one does what they like best. I have blogged a recipe for Ishtu earlier when I wrote the recipe for another favourite of mine, Idiappam or String Hoppers. Here is the current favourite version of ishtu, the addition of caramelized onion on the top, adds a nice depth to the flavour of this dish. Onion – 2 medium, 1 to be chopped roughly, the other to be sliced in semi circles and set aside. In a pan heat the oil and fry the sliced onions till golden brown on a gentle heat. Remove the onions onto a plate and set aside. Continue to add the star anise, cinnamon, cloves, cardamom and pepper corns in the same oil, after a few seconds add the julienned ginger, chopped onion and green chilly. When the onions turn transparent, add the vegetables, ½ a cup of water, salt and cover and steam for about 7-8 minutes till the vegetables are tender, cooked but not mushy. Add the coconut milk, ½ cup of water (or adjust according to the consistency of gravy desired), simmer for a minute. turn off the heat and let it stand for atleast 10 minutes before serving.